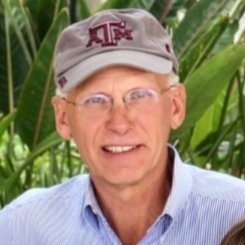 Russell Wayne Denkeler, age 59, passed away on April 04, 2019. He was born on October 18, 1959 to Gerhardt and Audrey Denkeler in Corpus Christi, Texas. He was raised in Portland, Texas and graduated from Gregory Portland High School in 1978. In 1983 he graduated with a Bachelor’s of Science degree in Mechanized Agriculture from Texas A&M University, College Station, Texas. He was a proud Aggie and worked very hard for his degree. Russell had been self-employed as a general contractor in Burnet, Texas for the last eight years, producing some beautiful work that is enjoyed by many. He was a very religious man, who had a passion for the great outdoors and enjoyed fishing and camping as hobbies. He also enjoyed spending time with loved ones, most notably, girlfriend and companion, Karen, and their dog Skippy. They planted and maintained a productive garden each year, one of many things they liked to do together. Russell was a loving Opa, son, father, brother, uncle, and cousin to many. He is survived by his mother, Audrey Denkeler, children, Allyson Malone (husband Randy, daughters Emery, Payten, and Laney), and Annie Denkeler. Sisters, Ellen Lott (husband Doug, and children Larry and Randa), and Joann Dorminy (husband Jerry and son Chason), and Karen Barr, his significant other. He was preceded in death by his father and his sister Linda Briley. A visitation will be held at 10:30am at Seaside Funeral Home. Services will be held at 12 o’clock in the afternoon at Seaside Funeral Home Chapel on Thursday, April 11, 2019 with interment to follow at 1 o’clock in the afternoon at Seaside Memorial Park. Russell’s legacy will continue to live on through the lives of others.